On this date in 1939 in Vatican City, Roman Catholic Cardi­nal Eugenio Pacelli was elected pope on his sixty-third birth­day. His coro­nation took place ten days later. 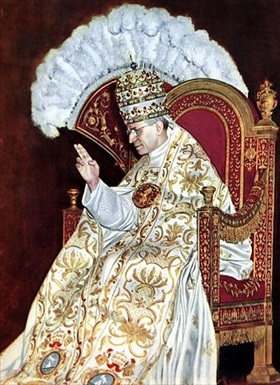 Pacelli took the name Pius XII. Pius’ actions during the Holo­caust are contro­ver­sial. Critics have accused him of every­thing from anti-Semi­tism to col­luding with the Nazis. His defenders argue that his mostly silent diplo­macy saved hun­dreds of thou­sands of in­no­cent vic­tims and Jews from Nazi ter­ror. Before being elected to the Papacy six months before the out­break of World War II in Europe, Cardi­nal Pacelli had lived twelve years in Bavaria, the birth­place of Adolf Hitler’s Nazi Party, serving as Apos­tolic Nuncio for all Ger­many. He was well aware of the Nazis’ anti-Semitic prac­tices and their extraor­di­nary pen­chant for bru­talizing their enemies. Reacting to wide­spread criti­cism of the Vati­can’s con­cor­dat with Hitler’s govern­ment in July 1933—an agreement that he, as then-Vatican State Secre­tary, had been instru­men­tal in drafting—the future pope pri­vately told the Brit­ish ambas­sador in Rome that the Catho­lic Church deplored the actions of the Ger­man govern­ment at home, their per­se­cution of Jews, their pro­ceeding against poli­ti­cal oppo­nents, and the reign of terror to which they subjected Ger­many and Austria. Between 1933 and 1939 Pacelli issued fifty-five protests of vio­lations of the Reichs­kon­kordat. In his first en­cyc­li­cal letter as pope, issued a month and a half after the Ger­man in­va­sion of Poland, Pius XII called for the re­stora­tion of that coun­try’s inde­pen­dence, de­nounced racism, and called for love, com­pas­sion, and cha­rity to pre­vail over war. For much of the war, Pius XII main­tained a public front of neu­tral­ity, in­dif­fer­ence, or silence while Ger­man atro­cities were com­mitted out­side Italy. Pri­vately and occa­sion­ally publicly he inter­ceded to help Jews; for ex­ample, in July 1944 he pushed the Hun­ga­rian regent, Adm. Miklós Horthy, to cease his govern­ment’s depor­ta­tion of Jews to Nazi death camps. When the Ger­man SS began fer­reting out Jews from in­side Italy in 1943 in places where the Wehr­macht held sway, such as in Benito Mussolini’s so-called Repub­lic of Salò in north­ern Italy, Pius XII directed the Catho­lic Church to make sub­stan­tial efforts to save Italian Jews. In the end, four-fifths of the Jewish pop­u­la­tion of Italy escaped slaughter—a remarkable record of moral courage. 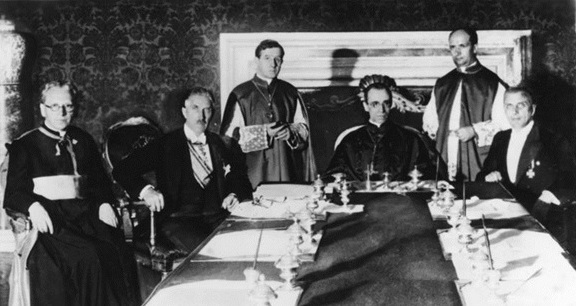 Above: Vatican Secretary of State Eugenio Pacelli (seated, center) at the signing of the Reichs­kon­kordat (treaty with Ger­man Reich) on July 20, 1933, in Rome. Seated to Pacelli’s right is Hitler’s vice-chan­cel­lor, Franz von Papen. Between 1933 and 1939 Pa­celli issued dozens of pro­test vio­lations of the Reichs­kon­kordat, which he had hoped would pro­tect the rights of Catho­lics under the new Ger­man govern­ment of Adolf Hitler. Pacelli’s actions as sec­re­tary of state and later as Pius XII have gen­erated con­tro­versy, par­tic­u­larly on the sub­ject of the Holo­caust. An entire library of books has been built either defending his papacy or taking him to task. His detractors have accused him of every­thing from anti-Semi­tism to col­luding with the Nazis (“Hitler’s pope”). Others claim the Catho­lic Church did more than any other reli­gious body to save Jewish lives, occa­sion­ally through the pope’s per­sonal inter­ven­tion; e.g., when Pius XII in­structed papal diplo­mats to aid per­se­cuted Jews in occu­pied nations, contri­buted money to aid des­per­ate Jews, opened Catho­lic facil­ities in the Vati­can and in other parts of Rome and Italy to shelter thou­sands of Jews from the Nazis, and gave direct face-to-face orders to protect Jews from the Nazis. Right: Pope Pius XII on his day of coronation, March 12, 1939. 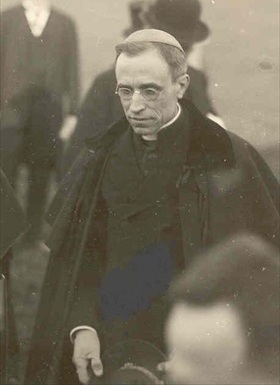 Pacelli (1876–1958) took the same papal name as his predecessor, a title used exclusively by Italian popes. When Pacelli was elected pope, the Nazi regime registered strong pro­tests and called Pius XII the “Jewish Pope” because of his ear­lier con­dem­nation of German race laws.